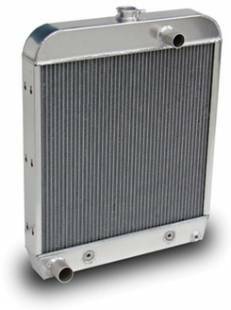 This is a 1952 Ford truck radiator with cap for use with a small or big block Chevrolet engine. PRC radiators are all aluminum and do not use epoxy in their construction. Aluminum tanks can be easily polished for a show-car finish. Top hose outlet measures 1-1/2" o.d., lower hose outlet measures 1-3/4" o.d.